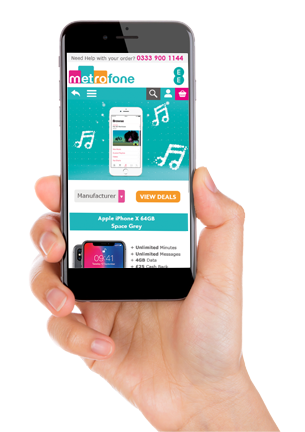 Metrofone have spent years building up an extensive knowledge base and working with the very best mobile phone manufacturers and networks to ensure that we can deliver the very latest deals and offers to our loyal customers. We are now partnered exclusively with EE, one of the UK’s leading mobile communications networks because we want to be sure that our customers always have the very best service and connection regardless of where they are. Looking for the Latest Smartphone? If you’re on the hunt for the latest EE smartphone deals then you have come to the right place. Here at Metrofone, we work exclusively with EE to bring you our best smartphone offers ever so that you can be sure you’re getting the perfect deal to suit you, and getting massive savings too! EE is widely regarded as the UK’s most advanced digital communications company, delivering their services to over 31 million users across mobile, fixed and business networks. When you add to that the fact that EE provides 4G connections to more locations than any other network, it is a no-brainer as to why we’ve decided to work with them. We want to feel rest assured that each and every one of customers receive the very best network service out there. So, whether you’re interested in the very latest iPhone, a classic Samsung handset, or even if you want to go for something completely different, Metrofone will work their very hardest to find you the very best smartphone deal to suit your requirements. But we won’t stop there; we’ll also make each and every deal all the better by adding on a fantastic cashback deal where we can so that you can potentially save even more money. One of the best things about choosing to go with EE on your next pay monthly contract is that they offer loads of fantastic added perks. You could get free BT Sport for three months, free roaming and, if you opt for an iPhone handset, could get six months free Apple Music where EE will even pay for the data! When you order your brand new smartphone with Metrofone you can be sure that your security is paramount every step of the way, and with our fantastic free delivery service, you could have your new handset the very next day for not a single extra penny! If you think you’ve found your perfect and handset and tariff, but want to know a little more, why not call our dedicated customer service team on 0333 900 1144. They’re based right here in the UK and are on hand with all the latest knowledge to answer any query you might have and listen to your needs.